Introduced to meditation at the age of eleven, Stacey Stern has always been drawn to exploring inner worlds. A writer, coach, and communication consultant, Stacey loves helping people access and articulate the clearest, truest vision of themselves and their work. She guides businesses and non-profit organizations to raise the bar for their internal and external communications, and she partners with dynamic leaders to coauthor books about personal and professional growth and spirituality. More high energy than zen personality-wise, Stacey is authentic to the core and brings her heart, mind, and integrity wherever she goes. Mother of two wonderful young men, Stacey resides in Boulder, Colorado. Ordained as a Buddhist monk in his native Sri Lanka at the age of eleven, Venerable Bhante Sujatha is singularly focused on adding more love to the world. As Founder and Spiritual Director of Blue Lotus Buddhist Temple and Meditation Center in Woodstock, IL, Bhante leads a congregation and also teaches loving-kindness to people worldwide seeking the art of contentment. Bhante gives more than 380 talks and guided meditations annually, for which he travels hundreds of thousands of miles, often going straight from the plane to a podium. He speaks at temples, churches, meditation centers, yoga studios, schools, and universities. Whether he is leading a small group retreat or consulting with corporate giants, Bhante teaches that love is the way and peace is a constant practice. His humanitarian work spans the globe, and this tireless crusader sleeps a mere three or four hours a night. 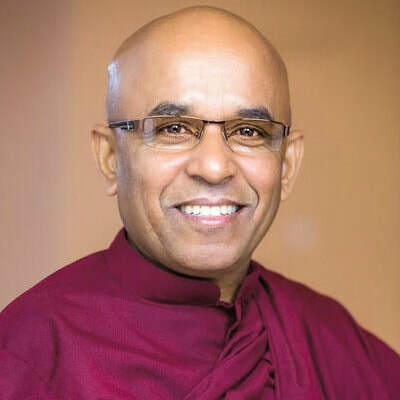 In recognition for his incredible impact in spreading Buddhism in America, Bhante was awarded the highest honor within his lineage when he was named the Chief Sangha Nayaka of North America in 2013. Bhante’s approach to meditation is deep and simple, and he shares core Buddhist teachings in ways that are practical and easy to understand. A radiant, funny, and wildly energetic monk, Bhante helps people attain peace that can only be found in deep silence. Each one of us is born with spiritual tools that get obscured over time. Under the influence of even well-intentioned friends, families, teachers, and society as a whole, we often lose touch with our innate wisdom. The great news is that even on our darkest days, deep spiritual truths lie within us, awaiting our mindful attention. In this way, we each sit upon our own toolbox—our own treasure trove of inner resources. Sitting on the Toolbox is structured to parallel a seeker’s journey. Part One, Opening the Toolbox, establishes a relatable foundation about problems in everyday modern life and key elements in the spiritual journey. Part Two, More Daily Tools, addresses challenges we contend with as we move through life—ego, fear, anger, and grief—and is filled with stories about how to lessen suffering. Part Three, Drilling Deeper, delves into what makes life richer as we move beyond surviving and into thriving through forgiveness, loving-kindness, mindfulness, and joy. If you read this book from start to finish, you will be guided on a progressive journey of exploration. However, each chapter can also stand on its own.